About: Enlivenze LLC gave our crew the wonderful change to review a fun little busy activity. The FlipStir Puzzles are just exactly what their name says. 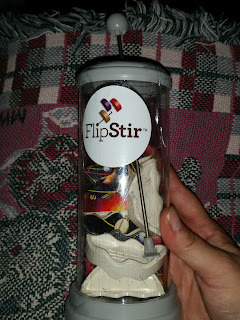 I got to test out the Level 2 Solar System FlipStir that is for children ages seven and up. FlipStir is a 3D self contained puzzle that you have to flip and stir to solve. The Solar System is a 10 peice puzzle. It is in a vase type container with a little stick that goes down inside it that you are able to pull in and out and around to help stir the peices in order to get them to match up and make your picture. That sums up the simple instructions: Shake, Stir, Solve! This was a great busy item to keep with us. No matter how many times the kids solved it I could shake it up really good and make it a new challenge for them to solve again. Not to mention being a self contained puzzle you do not have to worry about missing peices floating off. This made it great for on the go. We have many appointments for several things so we go alot. My only wish is that I would have had three to review to keep each of the big kids from bickering on who's turn it was to solve next. It really was a joy. Even my ADHD kids were able to focus on this to complete it. Since it's not horribly long to do it was perfect for obtaining and keeping their attention. A smile shake up and they were ready to go again with a new mix to resolve. It was so nice seeing them get excited as they were getting it together. I think this is a great busy game for any child that likes a challenge but may not handle tasks that take forever to complete. It also doesn't get boring quick since each time you shake it the peices are on a complete new order. Also check out what other puzzles my crew mates were able to try out, some of Level one as well.